Previous Article Tiggers Bounce, Should You? Thanks for sharing those workouts! I’m always looking to change it up on the treadmill. I try to only use it for speed workouts or when it’s raining outside. Some ways I try to keep occupied are watch videos on my phone, look at some of the weight lifters in the gym and silently critique their form (lol), or watch something on one of the gym TV’s. Doing speed workouts does make it go a lot faster though because you’re engaged in the workout and you’re constantly changing speeds, inclines, etc. 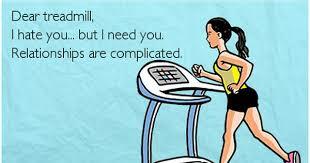 No way I would want to do a steady long run on the dreadmill. I did it once and it was 100% misery. I’m with you – I generally loathe treadmills, but sometimes they’re a necessity, and they do allow you to do more tightly controlled workouts. Personally, an iPad with a good TV series loaded on to it is the only way I can get through the monotony! I don’t like the treadmill at all and don’t use it. I’m sure you’ve already considered ellipticals? Since the weather change I’ve shifted my cross training day to 1/2 elliptical session and 1/2 rowing machine session. The monotony is strong anyway but at least it breaks it up… sort of.